PHOTO: Allen Ramsey, DWCPhoto.com. Highlands junior wide receiver Jared Wogan (10) and senior wide receiver Brent Angel (16) run downfield on special teams in Friday's game against Scott County. Highlands travels to Union to face Ryle in a 7:30 p.m. contest Friday. The feeling in Fort Thomas is these last two football games slipped away. The Highlands Bluebirds (1-2 overall) opened with an impressive 52-42 win over the Cooper Jaguars, but have since lost two by a combined 12 points in a 24-21 defeat at Campbell County and a 42-33 loss to the Scott County Cardinals last Friday in Fort Thomas. Highlands hopes to avoid a 1-5 start going into district action like last year. But the Bluebirds knew this would be a rough stretch against teams ranked in the Top 10 in the Associated Press poll. It will be as much if not more of a challenge this week when Highlands travels to Union on Friday at 7:30 p.m. to face the undefeated Ryle Raiders (3-0) from Class 6A's District 5 with Cooper and Conner. Ryle started the season with a win over Covington Catholic (31-13), followed by a tight win over Lexington Henry Clay (34-28) before running away from county rival Boone County (42-7) a week ago in Florence. "There's an absolute sense of urgency," said Brian Weinrich, Highlands Head Coach. "If there's not then that's a problem. We're here to win games. We have to do what we can to get better every single day at everything we're doing to win this game." Former Lexington Catholic Offensive Coordinator Mike Engler is in his third season as head coach of the Raiders. Engler has guided the Raiders to a 17-10 mark with two appearances in the second round of the Class 6A playoffs. Ryle finished 9-3 last year for its first winning season since 2011 last year. Highlands has not forgotten what happened last year in Fort Thomas. The Raiders pulled away for a 48-24 victory in the first meeting between the two programs after a two-year hiatus and ended a two-game Highlands winning streak dating back to a 28-26 defeat in Union in 2010. Unlike last week when Highlands faced a traditional Wing-T team defensively. the Bluebirds will face an offense they've gone against in practice for many weeks. That's the Spread offense. 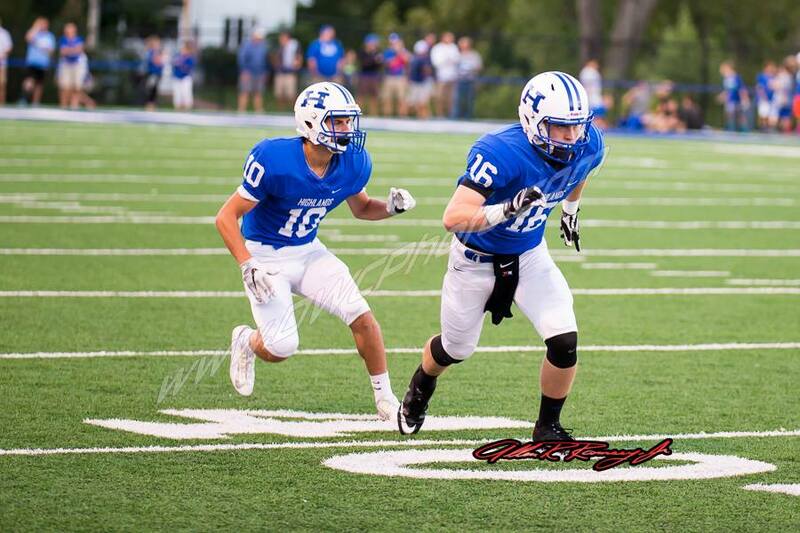 The next two opponents in Louisville St. Xavier and Simon Kenton also run versions of it. The Ryle offense starts with senior quarterback Tanner Morgan, a Western Michigan University commit. Morgan completed 22-of-37 passes for 249 yards and a touchdown in the Ryle win last year. Morgan has completed 51-of-82 passes for 689 yards and five touchdowns to several different receivers. Senior tight end Jake Long leads the way with 13 catches for 172 yards and a touchdown and senior Bryce Ashley has 15 catches for 133 yards and two touchdowns. "They're not just a one-man show," said Shelby Jones, Highlands Defensive Coordinator. "That got a lot of good receivers. (Long) is really good. Their running back Chisholm is a nice player. It just comes down to trusting what we're doing. Each players knows his job and he has to be completely focused on his job every play. It seems so simple, but it's not." Ryle has shown its balance with a nice running game having rushed for 645 yards and passed for 704. Junior Jake Chisholm leads the Raiders with 41 carries for 370 yards and three touchdowns for an average of just more than nine yards per carry and senior Cole Burch has 157 yards on 27 carries and two touchdowns for an average of about 5.8 yards per touch. The Highlands defense has allowed 836 yards rushing and 492 passing this season. But the Bluebirds showed some improvements against Scott County. Senior linebackers Dalton Cornett, Trey Bowden and junior linebacker Luke Ross had fumble recoveries against the Cardinals. Cornett leads the Bluebirds with three fumble recoveries and senior defensive back Kyle Rust has the lone Highlands interception on the season. "I think you have to trust your keys and go fast," Ross said. "If you mess up, you need to mess up going fast. There's no question your effort will take you to the ball." The Highlands offense did not convert some fourth downs in the loss to Scott County and the two turnovers also stopped drives. Weinrich said Highlands hopes to clean up things on the offensive line this week to open more things up. The Bluebirds have rushed for 662 yards and passed for 584 this season. Senior quarterback Brady Gosney found junior wide receiver Nick Veneman for nine receptions for 225 yards and four touchdowns. That lifted Gosney's totals to 39 completions on 64 passes for 584 yards, four touchdowns and three interceptions. Veneman has a team-high 15 catches for 384 yards and four touchdowns. "We're making sure we're communicating with pass protection," Weinrich said. "We're doing a good job as far as the (running) backs and quarterback with where the pressure is coming from. When we we were studying Scott County then carrying it over to this week, we're trying to understand what is happening in front of us." Ten different receivers have catches for the Bluebirds. Gosney hit Veneman over the top for three touchdowns. But if the receivers make plays on shorter routes, that could open more things up deep for Highlands. "If more people get the ball this week and more plays get made, our offense will be deadly," said Jared Wogan, Highlands junior wide receiver. "That's what we're working on this week. (Short routes) make the defense jump and recognize it more. You just have to do what you can to help the team win." It could also open things up for the Highlands running game that gained just 95 yards last year. Highlands senior running back Grant Murray has 59 carries for 322 yards and four touchdowns for an average of just under 3.4 yards per carry and senior running back Jared Pulsfort has gone for 233 yards on 44 carries and four touchdowns for an average of about 5.3 per carry. Ryle changed to a 4-2 defense this year compared to a 3-4 defense last year. Cooper ran a 4-2-5 defense. Ryle's Defensive Coordinator is former Covington Catholic linebacker Mike Woolf. Teams have rushed for 327 yards against Ryle and passed for 611. "It is a little different than what we're used to," Weinrich said. "Defense is defense. Guys have to hit the gaps we need to have good blocks." Senior inside linebackers Jackson High and Colin Demetrakis lead the Raiders with 19 tackles and 14 tackles respectively. The Raiders have recovered one fumble and intercepted two passes on the season. The Bluebirds lead the all-time series, 11-3. The only other loss to the Raiders came by a 27-3 count in 1995.